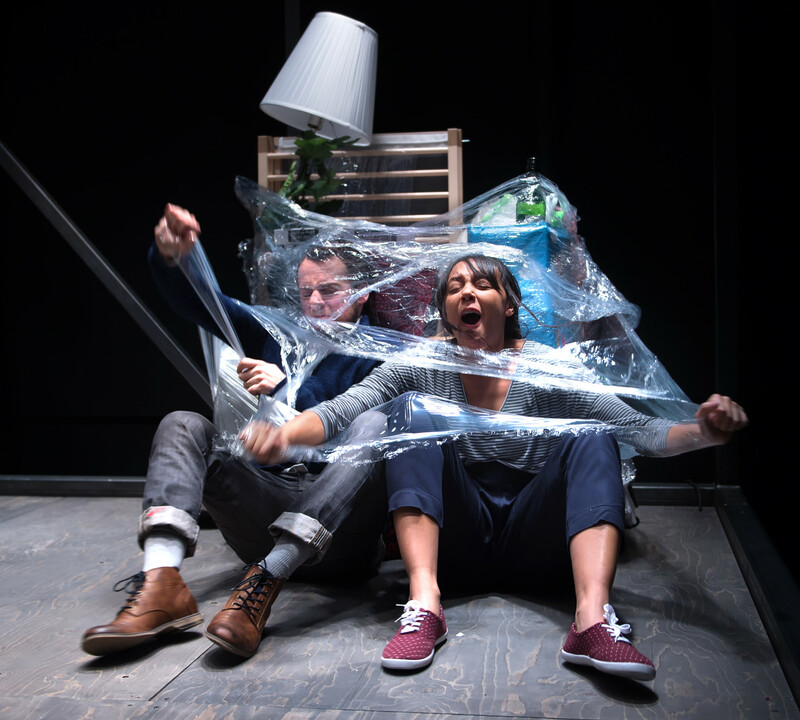 Like David Lindsay-Abaire’s Rabbit Hole at Hamsptead Theatre, Nina Segal’s In the Night Time initially offers us a domestic scenario: a couple and a child. But there, similarity ends. Or almost ends. For though the two plays couldn’t be more different in treatment and content, they roughly end in the same place. After all the traumas, in In the Night Time, the couple nestle into each other and start, step by step to resume what passes for `a normal day’. In Rabbit Hole, Becca and Howie gingerly take each other’s hand in mutual comfort having been horribly divided, unable to assist each other – as so often happens – in their grief. Similarly, Segal’s Man and Woman are unable to give each other empathy and support in their distress. But Segal’s In the Night is a far cry from Rabbit Hole in its tone and scope. And despite technical problems almost half way through the performance I saw which meant an unforeseen hiatus, there’s no disguising the power and impact of Segal’s writing. 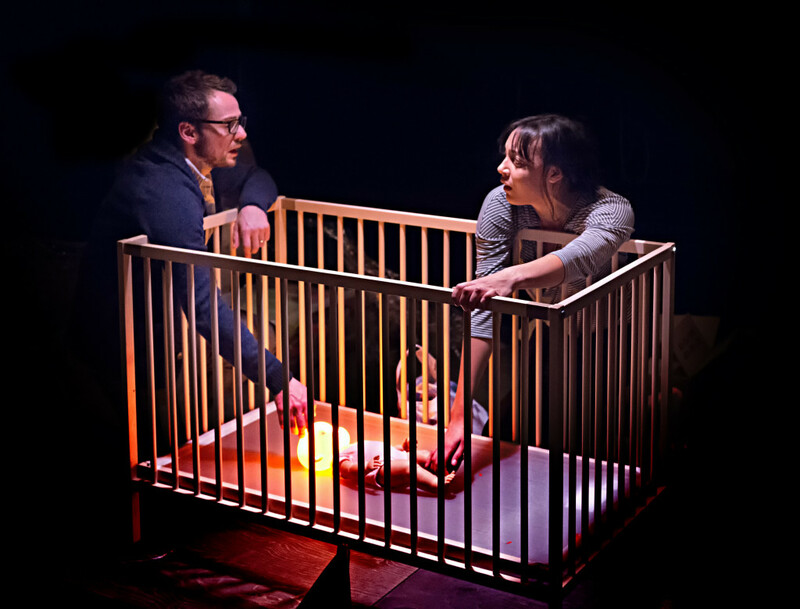 As if an elegy to a dying world, Segal not only contemplates the ordinary and domestic through her couple who fall in love and have a baby, but like Caryl Churchill’s Escaped Alone reaches outwards to embrace the entirety of our poor, broken planet with its apocalyptic vision. 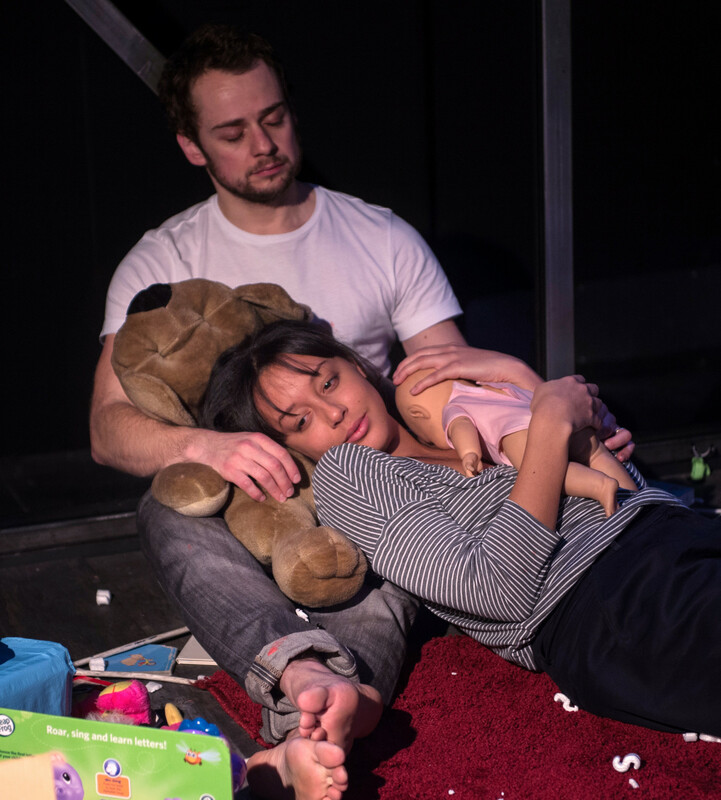 Ben Kidd’s production is spare and homespun, confined and expansive as the baby’s incessant crying destroys the couple’s love and seems to foretell nuclear Armageddon. The small square box, at first covered in the detritus of domesticity and cheery toys, gradually cracks and disintegrates as Segal’s prose becomes ever more heightened, metaphorical and universal catastrophe enters. Segal’s passion and concern is conveyed with soaring, almost poetic simplicty to which Waldmann and Leonce respond with aching naturalism. An hour long, In the Night Time feels stunningly relevant, a cry of woe – and maybe impotence – in the face of grinding forces. And yet, a la Beckett, they will go on. A symbol of fragility, an egg, is squashed hard by the woman. And does not break. `You have to find the strongest part’, she says. And so you do. © Bill Knight, Alex Waldmann and Adelle Leonce. This entry was posted in 2016, Reviews and tagged Adelle Leonce, Alex Waldmann, apocalyptic visions, Ben Kidd, broken planet, Caryl Churchill, David Lindsay-Abaire, Gate Notting Hill, Nina Segal, poetic incantations on February 14, 2016 by Carole Woddis.